Our core business is supplying the mining sector with freight & distribution solutions which includes the use of specialized equipment for rigging and earthmoving purposes, with skilled and licensed operators. 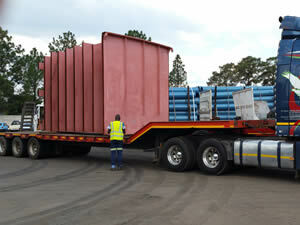 Our Company now offers low bed and crane services that are also ready to operate all mine regulations. The Company was formed in 2000 by Mr. L. K. Moodley, where he bought his first vehicle and began transporting products on behalf of Minova RSA, to various mines around Gauteng and surrounding provinces. The Company is owned and managed by Mr. L. K. Moodley, who has been in the transport, warehousing and distribution industries for 20 years. Assisting him is Nelson Naidoo, who has also been in the transport and warehousing industry for the 15 years. We have formed a partnership with key construction experts to focus on construction projects within South Africa. We are a BEE company that is growing in clients and revenue, backed by available resources the company is ready to effectively manage any projects to full implementation.